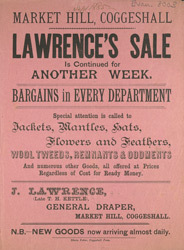 Drapers stores served different classes of customer however they all received a very different quality of service. The gentry, who shopped in the morning, would send a servant to inform the draper that they wanted service on a particular morning. The proprietor and the most senior staff assisted the customer who would not have entered the store but would wait in a carriage outside while the staff brought fabrics outside for approval. The middle classes entered the shop and would take time to choose appropriate materials making sure that they haggled with the assistant to ensure that they got the best price.